Throughout the span of recorded human history, Pinecones have served as a symbolic representation of Human Enlightenment, the Third Eye and the Pineal Gland. Conifer Pine Trees are one of the most ancient plant genera on the planet, having existed nearly three times longer than all flowering plant species. 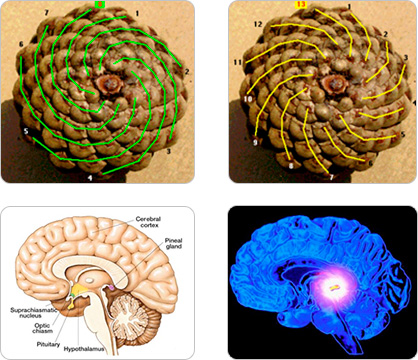 The Pinecone is the evolutionary precursor to the flower, and its spines spiral in a perfect Fibonacci sequence in either direction, much like the Sacred Geometry of a rose or a sunflower. It is our biological Third Eye, the "Seat of the Soul," the “Epicenter of Enlightenment” -- and its sacred symbol throughout history, in cultures around the world, has been the Pinecone. The Egyptian Staff of Osiris, dating back to approximately 1224 BC, depicts two intertwining serpents rising up to meet at a pinecone. Modern scholars and philosophers have noted the staff’s symbolic parallels to the Indian “Kundalini,” a spiritual energy in the body depicted as coiled serpents rising up from the base of the spine to the Third Eye (Pineal Gland) in the moment of enlightenment. Awakened Kundalini represents the merging and alignment of the Chakras, and is said to be the one and only way to attain the “Divine Wisdom” bringing pure joy, pure knowledge and pure love. Depictions of Hindu deities are also interwoven with both literal and symbolic representations of serpents and pinecones. In some cases, Hindu gods are carved, sculpted or drawn holding a pinecone in outstretched hand. Shiva, the most prominent god in the Hindu tradition, is consistently depicted with a head, or coiled hair, shaped in marked similarity to a pinecone and interwoven with a serpent or serpents.